While the Halifax Greek Festival may be best known for it’s food, we also offer an array of activities and events for our guests to take part in. It has always been important that our festival not only showcases our culinary specialties but also our Greek cultural and historical roots. 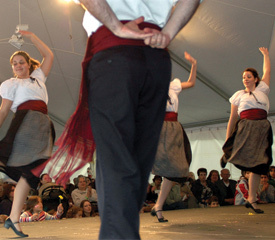 We have several dance troupes to entertain you while enjoying your souvlaki (check the schedule of events for time). In addition we encourage people to visit our Exhibit room depicting Greek lifestyle, crafts, art replicas, and religious artifacts, or take a tour of our Byzantine Greek Orthodox church. Visitors will marvel at the iconography and the interior architecture of our church. Alternately if you’re with kids in tow – families are encouraged visit our Kids Olympics area – fun for the whole family!